Clamp ends that are attached to standard diameter steel pipes. When I was a lad serving my time we had a huge stack of sash cramps. The old saying is that "you can never have enough clamps" and that is right. At odd times you need really long ones, other times you need medium or short. At a minimum you can do a small job with just one clamp but most times you need a few. 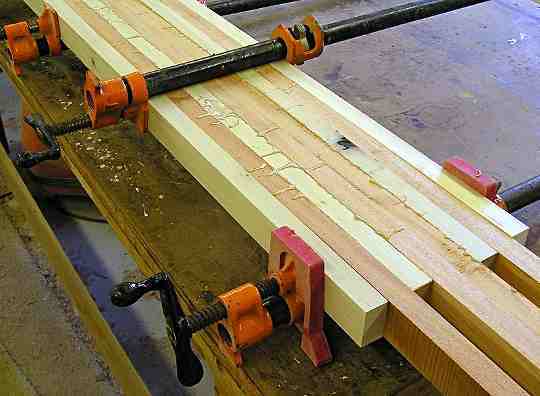 Traditional "T" bar sash clamps are excellent tools but they are expensive. These pipe clamps are good quality but fairly cost effective to buy. Buy the clamps on line and source cheap pipe locally, if and when you need it. You can buy your pipe cheaply in long stock lengths and cut it up yourself. You may be able to pick up second hand pipe. The pipe of choice is usually galvanised, but if you can pick up some black pipe cheap then go for it. Especially for those "one off" very wide jobs. Note the one up and one down position of the clamps. This is the correct position for gluing up jobs like this. If all the clamps were the same way up then there is always a tendency for the work to bend or curve due to the action of the clamps. A good idea that has caught on. A workshop can have quite a lot of different sized clamps by just buying the ends and then buying cheap lengths of pipe with standarp pipe threaded ends. The threaded end of the pipe screws into the fixed end fitting with the tightening handle. The other end can slde freely along the pipe but when pressure is applied it jams onto the pipe. This type of clamp is not restricted to woodworking of course, they are made in larger versions to suit bigger diameter pipes.